As you may already know, I start nearly every day with a green smoothie - I think it's a great way to set the tone for healthy eating all day, as well as insure you're getting loads of nutrients into your diet. Sometimes however, you want something heartier - this is when a smoothie bowl is a great swap. A little thicker, a little more substantial, and if you add the right ingredients, it can really power you through the day. I recently connected with Brenden Fitzgerald, founder of Planet Protein, via Instagram. As a fellow vegan and Michigander, we hit it off immediately! When he told me about his Planet Protein bars, I knew I needed to try them! Luckily, Brenden was generous enough to send me some to try (thank you!!! ), and they're almost gone! 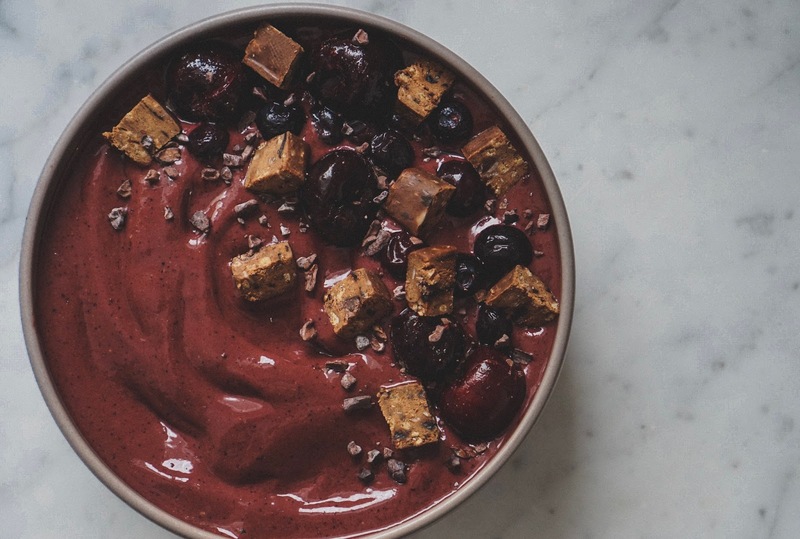 When I tasted the Cherry Almond Fudge flavor I was immediately reminded of one of my favorite smoothies that combines raw cacao and frozen cherries - I knew these two would combine to make a killer smoothie bowl! 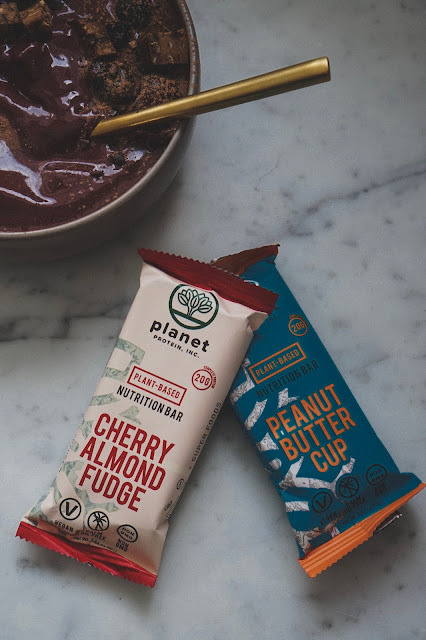 This recipe tastes downright indulgent, and could satisfy and chocoholic, but really is packed with tons of clean plant protein (thanks to Planet Protein) and tons of phytonutrients and trace minerals! Seems like a win to me, but give it a try for yourself and let me know what YOU think! Set aside half the protein bar. Place all other ingredients in high powered blender, I use a Vitamix 5200 (the tamper is helpful for these types of things). Blend together, this is meant to be thicker than a normal smoothie so use the tamper to help facilitate the blending. If using a blender without a tamper you may want to take a few breaks and mix things up with spatula. 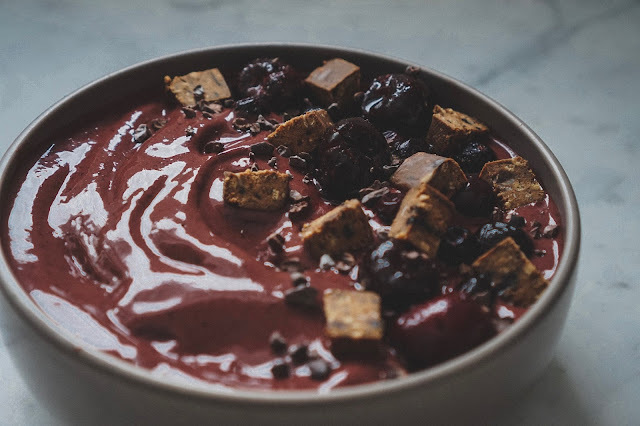 After the smoothie mix is blended, place in a bowl and top with the remaining half of the protein bar cubes, and if you're feeling fancy, more frozen cherries, blueberries and raw cacao nibs!